When will it become morally wrong for an agent to promote print to a vendor? A state manager for the REA Group recently posed this question to all of his business contacts on Linkedin recently. As real estate agents we are constantly called upon to recommend and then implement advertising on properties for sale (and rentals for that matter) that we represent. In many cases this is done with the owners funds with VPA (Vendor Paid Advertising). Unless you have been operating in a bubble there has been a dramatic shift towards online advertising in recent years and now real estate portals like realestate.com.au and domain.com.au dominate the landscape for property enquiries for virtually all offices through the country. But is print dead? Hardly. Certainly over the past 10 years the once dominant print media has lost its gloss as what was once a one horse race had another player enter the game. Print is probably not even a close second at the moment. Print is obviously on the way out, but its still got a long way to go and for many agents as it still delivers enquiries whether it be from colour magazines, newspapers or printed flyers. What may keep print alive longer is the increasing costs of the top two portals and especially realestate.com.au who now has a $2000+ per month product in their bag of tricks. This price level is similar to print advertising costs. Go back 5 or 6 years in time and find me anybody who would have predicted that online advertising for a property could have cost that much. With realestate.com.au’s reputation for price gouging the industry every year with huge price rises what will they be asking for this this top shelf product in a few years. So should agents be asking when is it time to stop using print for vpa? Of course… we do that every time we propose marketing to an owner. Industry detractors will always suggest that advertising is done to promote the business not the property but I have never met an agent who will throw away good money, whether it be their money or the owners, when they knew they would get no enquiry from it. That is totally counter productive of what we do. So should REA State Managers be questioning the morals of their customers? The comments made by Tom Ainsworth, the Victoria and Tasmania State Manager for the REA Group to over 500 connections on linkedin are probably not an official company position. Despite this many would argue that his personal comments would align perfectly with that of his employer. What puts an interesting spin on it though is that according to his Linkedin profile before he started at REA he came from the News Ltd stable of papers including the Geelong Advertiser Group and Leader Newspapers. Just a guess but I reckon when he was the Group Real Estate Manager at Leader Newspapers his opinion on agents investing VPA in newspaper advertising was a little different at that time. No doubt Tom would argue that his opinion has matured over time and as has experiences have improved… but I would suggest his opinion in both cases is tainted by the corporation who pays his wage! Whilst Tom’s employer would probably agree with him, I doubt realestate.com.au’s master, News Ltd would find his comments on the money! 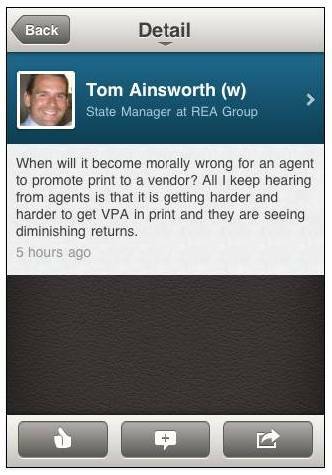 I personally think Tom has a huge conflict of interest in questioning the morals of real estate agents if they select something that he does not sell. That does not mean he has no right to ask it as after all it is an interesting question that we ask ourselves all the time. I just don’t think he will like the answer that comes back! The value proposition of the subscription portals is falling, partially because the subscription costs are rising well beyond sane levels but also because they have seemed to hit critical mass. For many years we were use to realestate.com.au growing massively month on month… but that growth has stopped dead in its tracks. Even realestate.com.au’s monthly reports have stopped adding zero’s on to all of the numbers like they use to. A couple of years ago I thought the death of print advertising in the very near future was a fait accompli. Now I am not so sure. No doubt it will happen one day, but that is more than likely because newspapers themselves will become a digital experience rather than agents stop advertising in their pages. Agents will then probably still advertise in that digital newspaper version. There is and and always will be exceptions to the rule as around Australia some agents are already forced into an online only strategy with either low levels of VPA or agent funded advertising. For most of the agents around Australia total print advertising expenditure has dropped but is still a viable option delivering value enquiries. Print will continue to decline and online continue to improve and one day what Tom describes will come to pass…. I just dont think that day is coming for the industry at large in the next year few years. Despite what Tom would have you believe, agents will advertise where ever they think will deliver them the most number of quality enquiries. The biggest “bang” for the “buck”. It is just not good business to waste money on ads that dont produce a result. Are Tom Ainsworth’s comments the arrogant ramblings of an REA employee trying to toe the company line or is he on the money? Considering he is an industry service provider with an obvious bias towards his employer should he even be questionings agents, his clients morality or not? Should agents be spreading their advertising across all types of media, old and new… or should we be only investing in online? And at the end of the day it boils down to one point.. Is print totally dead or is there still life in the old girl yet? Agents… We would love you to comment on the print experience for you and your office, but please share the type of market you operate in to give it some persepctive… suburban outer Melbourne, small town South East Queensland or Sydney CBD etc etc. 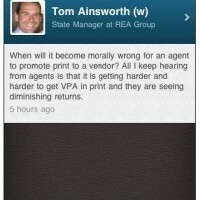 49 Responses to Is it Immoral for Real Estate Agents to Suggest Print VPA? Such a well written article Glenn, covered all the points there. From what we have experienced in our area (suburban Brisbane), print media has become even more important than ever before. The ability of print to deliver quality buyers time after time has been proven. From my personal experience here, a property listed online only is likely to only deliver one buyer (if any) to the first open home. This same property once advertised in print media (one or two weeks later) will then easily deliver 5-6 buyers through an open home. This result can be seen with a property that is advertised in print media initially also. These aren’t just ‘tyre kickers’ either, they are genuine buyers looking to purchase. A good example of this can be shown with an auction property – buyers from the internet have submitted offers at $450,000 whereas print media buyers have submitted offers up to $50K more. Another interesting example was with a property on the books recently that was open listed. Two agents were involved from the same day with the owner opting to advertise in print media and online with us and the other agent online only. Over the same four week period, our online ad had generated 500 hits, the other agent’s online ad had generated 130. This may be other factors at play here (such as positioning online) but the tendancy of buyers now is to see the property in the paper, then go online and find out more info which seems to be the case here. Hence advertising the property in the paper led to four times the enquiry. This data was consistant with open inspections on the same property, our opens over a four week period had generated 19 inspections and 3 offers, the other agents open homes had generated 6 inspections and no offers. This is just our experience in the market at present. I would be interested to hear others – for us though print media is still delivering far more buyers that online. I think Tom’s comment shows a lack of understanding of the industry, the pressures within a real estate office in today’s market and marketing in general, obviously mixed in with a dose of self interest. REA have an ever increasing number of options and with the addition of promotion of services to consumers to get the agent to upgrade the listing on REA or for the consumer to pay for it could this not be seen as VPA of another kind? The difference is that it is OK with Tom because the money would be spent with REA. Some in REA believe that their subscription rates should be the same as what some agents are paying for a page (in some cases thousands of dollars) of print advertising and if they could get it I am sure that they would try. The whole online – offline marketing mix has changed for real estate marketing but print still has a place in today’s market. Printing VPA is just one of the our commercial property management services. You have to be innovative when your on the market at the moment. The market is very competitive. Have you read this very insightful article about The Internet Economy in the G-20 The $4.2 Trillion Growth Opportunity ? I found it on my linkedin page this morning. I had not read that particular article but have read plenty like it… but I am not grasping how you think it particularly relates to this article or are you just making a more general comment ? Hi Glenn. Interesting.. What I look at is the R.O.I for both the real estate offices and the vendor. If you are going to spend $500 or $1000 or $10,000, you need that money to work the most efficient way it can. It’s a fact with newspaper advertising, that the ad appears on the day you pay for it to be in the paper, then then following day the ad is gone forever. If you chose to spend that money online, your money would then working 24 hours a day, until you decide to take that ad off. With consumer buying habits mainly directed at online methods, it just makes more sense to promote predominantly online. (Especially if you had to choose between one or the other) If you are using VPA, online marketing will create much more of an opportunity for the owners property to be seen to the world. (not just a local community) And I don’t mean only on the real estate portals. There are so many other fantastic ways to promote yourself, your company and your properties online. Newspapers and real estate portals – hopefully are going to be a thing of the past in not to distant future. Another thing is, that newspaper companies did such a great job of teaching agents how to get VPA – all for the newspapers benefit, that it became the done way. We need to stop relying on 3rd party companies to promote our real estate offices and our properties. We have already seen the effects regarding ever increasing prices from all the companies real estate agents rely on to promote.. It’s only going to get worse. Agents need to embrace online methods and also work on their own strategies for creating traffic, leads and conversions. Cost versus benefit? $ per enquiry? anybody have a figure? I have seen many properties advertised using full or half pages in newspapers at over $1200 a page which lasts one week at best and ONLY is seen the people who get it locally. The cost per property of a single listing within the “all you can eat” model of REA at $1200 a month is tiny and its ready wherever , whenever the buyers are. Then there are free portals…..
What is the cost per enquiry by comparing print to web? More accurately – and easier to count – what was the origin of actual sales – from print versus online? Does anyone have this ratio? Its a simple metric which should resolve alot of debate, and be very interesting. Print only reaches the delivery area for one week. I have heard agents say – print generates listings ( through profile), web generates buyers. Glenn, I think Tom is out-of-touch with what really happens and has completely ignored the significant amount of traffic that a real estate agent’s offline media drives online to their portal. Due to the nature of print, you can only provide a limited amount of content within a Print Media ad which then creates curiosity and drives browsers online to see more info. Even though the agent’s website is typically the only website URL advertised in the print media ad, almost half of the people who subsequently go online to get more info about that property (photos, description, floorplan, videos, etc) end up going onto the major portals to find the information. This traffic normally ends up on the major portals directly or by Googling the address of the property!!! Unfortunately, a lot of agents seriously don’t get how much traffic their offline media drives across to these major portals nowadays & obviously neither does Tom. If a marketing agency suggested a print advertising campaign (for any industry) they would normally consider customer behaviour and use tools designed to track & measure the response. If they knew that a lot of the customers were going to a completely different destination to find the information they would do different things to detour that traffic away and lure them back to their own online campaign and not end up where all of the competitors are highly visible. TIP for Agents: A great question to ask your customers isn’t where did you see the property, but rather “Where did you first see the property?”. Interesting article but you contradict yourself. You make the point that “there is and always will be exceptions to the rule as around Australia some agents are already forced into an online only strategy with either low levels of VPA or agent funded advertising.” By making that point you actually agree that online is a more cost effective strategy. You also make the point that there is a future for print in the digital versions of the paper but in making this point you miss the essence of the argument. The people who use online to search for property are using the portals for many years now. They are not going to switch to digital versions of the paper now – the newspapers, if they had been clever enough would have created that product about 15 years ago. Since more and more newspapers are now charging for access to content, are you suggesting that in the future people should be charged for viewing property searches and also dramatically change their search habits????? More of a general comment ! I think you are kidding yourself if you think that all real estate consumers are internet savy and i suggest there are some that dont even look a the internet. I have come across several people who when talking about the industry have not even heard about realestate.com.au. To reach all segments of real estate consumsers at this stage you still need to use a mix of offline and online marketing and dont forget the local aspect of real estate. The main change that has occured that has been discussed above is that the outcomes achieved by print advertising are now different to what they have been in the past. anyone heard of the yellow and white pages phone directories? yeah thought so …. they stop the door from slamming? boost up the TV a little? The newspaper is great to roll up to disipline your dog or clean the car windows perhaps? My point …. Print is dead!! Ask Sensis .. they’l tell you! forecasting 50% decline in revenue … scary !! Do you as an agent believe that, for the particular property you are marketing, print will reach the audience you are after? Better believe it that print media is around for a while yet and although the audience levels are dropping there is an audience that may match the particular listing that your vendor is trying to reach …. my older bowls club members!!!!!! How many 80 year olds are looking at taking out a 30 year mortgage? Roger, LOL- I’m talking about 50s to 70s. And not everyone needs a 30 year mortgage. Ever heard of babyboomers looking to downsize? Clearly enough evidence around to show that print media shouldn’t be written off yet. >>>>>>Interesting article but you contradict yourself. I contradict myself because I say that the majority still find print effective but there are a small number of exceptions. ???? huh??? You do realise that using the word majority means “not everyone” dont you? That is not contradictory to point out those that dont make up the majority … . >>>>>>>By making that point you actually agree that online is a more cost effective strategy. >>>>>>>>in making this point you miss the essence of the argument. But just so you understand where I was coming from as you clearly missed the point… I am specifically referring to when newspapers no longer have an offline version… ie.. at some point into the future. You mentioned cases where some offline newspapers charge for their online content… and that is happening right now.. but in those cases they are a print newspaper who just happens to have a website and they still have to fund the print presses, delivery etc etc.. so they feel compelled to have pay walls up. But instead of using an apple to compare to my orange example….. check out Brisbane Times.. the newspaper for Gen Y that has no offline version. They dont charge to access at all and it is something I have used for real estate advertising. I didn’t actually, My comment was pretty clearly referencing an REA staff member … but yeah.. they do. That does not necessarily mean they are right or wrong. You say that I as an agent have a conflict of interest. I do but its not nearly the same right in the context of the discussion. Let me explain. With regard to property advertising no matter if its print or online… the agent and the owner are the clients. We pay the money. Portals and Newspapers are providers, they receive the money for a service.. Lets consider it another way. REA is a butcher and Print is a Fishmonger. Is it surprising that the butcher recommends that you eat red meat every day instead of fish?? Has the butcher got a conflict of interest stating that you should eat red meat every day? Whether the agent or the owners pays it is still an expense. The owner and the agent both want the ad to deliver quality enquiries… As agents we do have a conflict of interest but that is a whole other discussion but generally centres more closely on who paid for the ad and is there a debt from the owner to the agent that jeopardises the fiduciary duty. Clearly that is your opinion…. I wonder why? Care to share how you are connected to the subject matter ?? Newspaper advertising has certainly lasted a whole lot better than I thought it was going to just a few years back. The interesting question is how long we feel it still has life for most agents….. Greg.. what are you thinking.?? Lisa, I agree with you about online providing all of those opportunities but this is not about which one is working best, it is about is Print still viable enough for agents to recommend it as a part of an overall marketing strategy. IMHO $ for $ online will win a direct comparison… but its not an A “or” B situation… its an A “and” B or A “and” B “and” C. As you have seen in some of the comments print is still working very well for some people. I think it will depend on your market and the price range of the property. On the Gold Coast if you sell in Mermaid Beach then print is king, but out here in Upper Coomera print pays a lesser, but still quite valid part. Glenn, I know where I get my leads from and I can track them every single day online. I know that my company’s marketing schedule spend is weighted approx 30% online, 50% print and 20% boards, photos etc but I get over 70% of my buyer enquiries from online. I’m been pushing for this to change cos people my age have moved on. I wonder what hold print publications have over the industry? Can you help answer that one Glenn? Have you looked at what percentage online represents across the different stages from enquiry to sale? We keep pretty good stats and the number for online change dramatically from enquiries, to inspections to sales. Print is not even close for enquiries and inspections but as a percentage of sales it gets much closer and still the reason why for us that it is still valid. Stats like these are always difficult. It should also be pointed out as Greg mentioned, sometimes a buyer comes from multiple sources. These stats were determined by what the buyer indicated, not what the salesperson indicated and it does not take into consideration multiple sources. .
Online covers a range of lead generation and websites we operate in addition to portal enquiries. We are currently getting about 400-500 unique visitors per day for just the Nerang website with about 85% of that delivered by the search engines. IMHO as Gen Y starts making up the majority of the sales you will see print in its current format fade out totally if it has not already. Newspapers may move online totally and be able to keep some of the business away from current classified portal sites… but it will technically be an online play by an ex print solution..
>>>>>>I wonder what hold print publications have over the industry? From a newspaper perspective their hold is a fraction of what it was… but there real power these days relates to their ownership of the portals. News Ltd owns a massive chunk of REA and Fairfax owns domain. There is also other media ownership in Western Australia as well. As to your comments regarding the percentage of buyer enquiries that online generates I think you need to look a little deeper. Look at what percentage it relates to inspections generated and sales not just enquiries.. Also.. ask the customer (ie. via surveys) where they first found the property…. not how they made the enquiry to you..
See my response to Chris right up the top of these comments. Also.. as Greg Vincent highlights, often there is more than one enquiry source involved. All of the above views are noteworth. I work Perth Eastern suburbs (some areas not so afflunent) and I agree online is taking over but keep in mind not everyone has access to the internet, some oldies and poorer segments actually still rely on print media to find a home. So I continue to use print media and online strategies and will probable continue to do so until there are no more newspapers. Glenn, real estate is different because agents work geographically nad the focus should be around using Print Media products more strategically and measuring response. It’s not something I suggest agents give up on in any hurry because on the web you become a little fish in a BIG OCEAN (especially if the agent doesn’t get their online marketing right in the first place). Agents can’t afford to rely purely on the major portals for positioning any more because the whole thing has become like Agent Lotto for consumers. Local content is the key to becoming “The Indisputable Trusted Advisor” in any market place and how local content is consumed is very important to an agent’s positioning strategy. eg. I don’t know if I’m the norm or the exception but I do read/watch the news online (sometimes via TV) but if I want to keep up with what’s happening locally I read the local paper (hard copy). Sure realestate.com.au provides the listing content if I’m interested in looking at a property or what’s on the market in my (or any) area, but the local paper gives me a different experience and since it’s something I read each week, whilst I’m reading through the paper I’ll nearly always have a look at the real estate section. I remember once, my Dad asked me if a particular agent was still in business any more because he hadn’t seen them in the paper for a few weeks. Listings are the lifeblood of any agency and becoming seen as “The Indisputable Trusted Advisor” in any area means getting called-in to more listing opportunities & when Print Media is used the right way with metrics and a strategic approach then I think we’ll see it survive a whole lot longer than most people expect. Jack, your comments are spot on. I would simply add that if we agents were spending only our own money, then would we spend $500 – $1500 for one day in a paper?…or would we spend the equivalent amount online? And if your life depended on it which would you choose? If its your own money that you are spending, then it is spent online every time. If its someone else money then that’s different straight away.Then yes, agents will often spend on poorly performing newspaper and magazine ads, because it is good for getting listings. No mystery in any of this and I am more interested in why the state manager of REA decided to raise the question. There is a motive in there somewhere because it seems such a bizrre question for an REA manager whose employer is majority owned by News Ltd, to ask. For the record, of the past 720 sales made through PropertyNow, I estimate that we used print advertising in perhaps 10 or 20 cases. I think I can see what you are driving at James but probably less than 5% have never heard of realestate.com.au. And regardless of whether they have or not, those people more than most would seek the instruction and guidance from their agents anyway. So whether the vendor knows about REA is rather unimportant. What matters is your opinion of its relative worth as their agent who is advising them. As for reaching the entire market that is not only unnecessary, its impossible. All that can be done at any given moment is to get the best bang for the buck. A marketing mix is great if you can afford to do it. More and more its not afordable so it becomes almost a moot point. I do agree with your final point that print outcomes have changed. We do a large amount of letter drops, just listed and just solds in the neighborhood, as well as newsletters to our client database. We also use a number of internet websites including social media, as well as print advertising in magazines and newspapers. And we ask every one of our new buyer leads, where they first noticed the property. I agree with you Glenn. There are pockets where print remains more useful than elsewhere. They are exactly that however, pockets. Generally they will be pockets of high end properties. Also don’t dismiss the ego factor of both vendors and agents wishing to have their property or logo appear in a glossy or a newspaper. Tom Ainsworth – if you’re reading this – you’re own morally wrong, biased opinion (posed as a question) is one of the most contradictory statements of 2012, and will be hard to top. Now I know where my REA Account Manager gets her tact from. And coming from someone with a 5 whole years print and online experience under his belt! In our Sydney office, we track definite spikes in online traffic (our own site, REA and Domain) for the day our local newspaper ads are published and generally the 2 days following. Print helps us cover every facet of the market, and as agents, we owe it to our vendors to cover these facets. This strategy will surely morph over the coming years, but I still foresee print working with our online strategy for a long, long time. Has anyone thought of the morality of the prices r/e.com.au gouge out of us (or the vendors if vendor paid) for the “top spot” or whatever they call it to push properties up the search results? Ten years ago I thought the web was going to save everyone some money. How dumb was I? What an awesome article! I think Tom may be a little out of touch though. Place recently provided a report showing that of all their homes advertised in print media, a whopping 55% of the eventual buyer first heard about the property through print. Matt Lancashire from Ray White New Farm said that for him, the same data shows 60% and for me its just over 50%. The problem is that a lot of agents tell Sellers that they sell all their homes from internet enquiry only. Of course, if they are not advertising in print, where else would their buyers come from. The statistics above prove that they are missing out on a lot of potential buyers by not advertising in print media. The facts are the more you promote a property, the more people will know it’s for sale. The more people that know it’s for sale, the more buyers you get through the front door. The more buyers you have, the more money you end up selling the home for. It’s morally wrong for an agent not to promote print advertising as it could end up costing the seller a lot because the best buyer may not end up knowing it’s for sale. Hi Everyone. Good to see this article garnering so much discussion. One thing, in this day and age it is quite easy to work out who is making comments on this site (and from where). Having a fake name and email address does not cut it in today’s age. We are happy for people to use fake names and emails, but you step dangerously into B2 outing you, when and if you pretend to be someone else entirely in your comments using bothy the fake name and email. We always will protect the anonymity of genuine people who do not ever need a reason to remain private, it is your choice! But dont pretend to be an agent, when you are clearly and easily identifiably not. Again , if you wish to remain anonymous you are protected here! Just dont pretend to be an agent when it is clear you are from, let’s say for arguments sake – a major real estate portal! Adds a whole new ‘morally wrong’ twist to the debate. That’s disgusting!!! I don’t think they realise their actions question their own morals by trying to deceive everyone else. I always find it interesting the number of people that go online to view a property. I think it creates a great option to view more details about a property, view photos, show to a family member/ friend etc. Why realestate.com.au can get away with charging so much – surprises me. I hope we don’t see further reductions in print media – yes its expensive and from a business stand point I always question the costs involved in advertising in print. But at the end of the day, it does generate enquiries. Its also nice to see information existing outside the realm of “online”. As a very active user of both online and print media i feel the debate can be summarised very simply by four words that describe the profile of buyers in the market place..Active/Analytical and Passive/Emotional, we need both forms of marketing to reach them all……simple. The sense I get talking to agents is print is good for prestige properties but online better for cheaper homes. I wonder if that correlates loosely with the generations looking at them, with print appealing to older people who have more savings and equity, and online appealing more to younger buyers? It is a very interesting debate because internet was supposed to be the great liberating force that gave alternative options to the soaring costs of print, and sure enough it started out cheap (and still is far cheaper than print). But the way it is heading is like history repeating itself. Tell me if I’m wrong. Third-party advertisers like REA, Fairfax (who I work for) seem to resonate more with consumers than the industry attempts to set up competitors, and ultimately what consumers think matters most. Agents might complain about the way those publications hike the prices…but not as much as they complain when a competing real estate agent gets a one-up on them, and the history of industry cooperation in this space is pretty grim. 1. It is a good aside for properties that are special in some way. I think today only properties well over 1 million, need to at least consider print! Great article and excellent commentary! The problem is that too many businesses (including real estate agents) look at this from a one dimensional perspective. They see the enquiry come through their email from a website and automatically think that it is that website that generated the lead. The problem with that (and this has been confirmed by a very major news companies own internal surveys) people often will see a sign, read a print media advert, see a photo in an office window, etc, etc, etc before they then go and check the property out online. Our surveys show 40+% of enquiries that come through the internet are firstly influenced by other forms of exposure. Hence the eventual enquiry may come via online however the initial interest may have come from a multitude of other sources including print. I know there are successful agents who do not use print and good on them but I liken it to the agent who say, I’m not on social media because I don’t think it works. It doesn’t work for them because they aren’t using it and they remain in ignorant bliss in regards to the business they are missing out on. In regards to print media I’m reminded of that famous quote by Mark Twain “Rumours of my death have been grossly exaggerated”. I certainly don’t believe the days of RE advertising in print are over – they are however under a great deal of pressure. If RE.com don’t stop gouging print will become more attractive again. Greg, just interested to see your comment that ” if you don’t get the buyers attention in a big way in the first 10 days you may as well take the property down” Do you really believe that ?? and if so – have you actually ever done that ?? That seems like a very odd procedure to try to market a property. Sounds a bit like John Cleese to me ” Sorry the property has been on the website for 10 days – we haven’t sold it – so lets get rid of it — and try to sell it in the paper” People (at least the majority) search in price brackets and so they look at the area they want, and everything in the price bracket. “Short term currency of an online presence” I would REALLY like to hear your theory on that one. I think the “entry point” for newspaper advertising differs depending upon the newspaper and it’s cost. You will find that major metro and national papers cost that much that only a prestige property could afford to invest in a significant display ad. Cheaper properties tend to fill the classified sections. In comparison regional and metro free weekly papers are cheaper to advertise in and thus the entry point is a lot lower. IMHO Online can be far better for prestige properties because you can open up so much more… Standalone websites, high end video, stacks of high resolution professional photography. What you see in high end properties is that print and online work together to provide a total marketing solution. Essentially you have the money to deliver whats required. You dont have to be young to prefer the internet and you dont have to be old to prefer print. Despite that age is probably the easiest way to delineate the two groups but it is not really 100% definitive. REA and Domain have done a far better job on many levels and especially with consumers. Dont rule out the alternatives though.. REIWA is making some amazing traction in WA as just one example. 2. why agents don’t use Google ads for property sales? 3. what would an average online (not ‘agent-branding’ print) budget be per property? why aren’t we discussing this in a newspaper forum? That would be effective don’t you think? Firstly, let me declare my occupation. I am currently the Advertising Director of the Daily & Sunday Telegraph (News Limited) and have worked in print and digital media for the last 18 years. 1. Apart from the fact most properties advertised in print are driven by VPA, the majority of properties advertised in print are auction properties. Early in an auction campaign agents need large numbers through opens and therefore a media mix is required to attract buyers through various touch points throughout the day. This is critical is it not? etc. In other words by using both print and digital marketing they capture different audiences at different times of the day in different mindsets. Again, I refer to a media mix. 3. I am always amused by the perception that newspaper advertising is expensive. Real Estate agents enjoy lower rates than most other industries because of the volume commitment they make. Other advertisers would love to be able to access those rates. It is also one of the few industries that can use VPA. Eg: Car dealers use their own money plus manufacturer support when advertising. 4. If VPA continues to be harder to secure, then the level of print advertising will continue to fall but not as dramatically as one might assume. An agents core competency should be to strengthen their corporate image so their staff members are presented to the public as professionals who can effectively solve problems for buyers and sellers. In other words, what about the newspaper as the listing tool? Lower VPA may mean the real estate industry should start to look at how other industries allocate marketing dollars. The general rule is 10% of revenue is spent on marketing. Progressive companies such as Carsales.com.au spend as much as 25% of overall revenue on marketing. How much do agents really spend on marketing? The above are simply my views and I welcome feedback. Thank you for your comments, well thought out and direct. Yes I agree with you on a number of points, particularly as a listing tool. As for Newspaper Advertising being expensive, well it’s problem lies not in its audience, but its analytics and the problem that newspapers face is that it is a one day tool, so compared to well researched and thought out web campaign , it is quite expensive. Newspapers must evolve into something more than what they currently offer, or they will suffer. I would love for you to contribute more to this site, as I think you have a lot to offer. 2. papers urge agents to use vendor funds to market their agency personnel & brands. I think that unfortunately for you, News Ltd in general is finding 2012 has brought with it a more intelligent marketplace. Hi Vanessa how do you monitor your print enquiries? Anyone in publishing hopes newspapers remain “one day” jobs. Readers expect different sections every day and the rejuvenation and change in sections have come about as a result of reader feedback. Imagine if a newspaper had the same ads every day? A newspaper campaign is not a one day job. Most agent schedules include a number of insertions and are a combination of suburban and metro newspapers plus digital, boards, flyers, etc. A point I would like to elaborate on more in a separate post is how a campaign all comes together and how all aspects are important levers. Singling out print is rather mischievous and one dimensional. On the VPA subject, are you suggesting newspapers invented the idea? There is no dispute we have a more intelligent marketplace. This has been the case since 2005 and more pronounced since 2007/2008 when the world changed forever. It has changed my life in that our sales teams are now capable of selling customer centric solutions across multiple platforms. I don’t want to and won’t get into a conversation about News Limited as I don’t think that would be in the spirit of participating to a site such as this one. Nonetheless, I can assure News is going along just fine. Some of us have clients we respect and can’t sell our morals (whether to do with value provided to clients or the type of media owner we deal with)!